History: This 26-year-old male had a rare brain tumor known as a ganglioglioma at the age of 18. When other men his age were worried about prom and college, he was going through brain surgery and getting radiation treatments to his head. The radiation treatments involved screwing a metal cage through the scalp into the skull as a necessary step to keep the head absolutely perfectly positioned during radiation treatments, and this left additional scars. When I met him, he had just passed the five-year mark post surgery with both gratitude for being alive and the sense that he would never be able to get past the memory as long as the scars were highly visible every time he looked at his head. But the final straw for him to seek treatment was the birth and growth of his little girl. One day she asked him what the scars on his head were, and even though he knew she loved him no matter what, he wanted to be able to go through the rest of his life without worrying daily what his daughter thought about how his head looked. Physical Exam: This patient’s hair was a dark brown throughout and showed significant hair thinning at two round (~10cm) areas on either side of the midline at his occiput (back of the head). These areas had both fewer and thinner wispy hairs, but were not completely bald. He also had several smaller “slick bald” areas where the cage had been screwed in to stabilize everything for the radiation treatments, and one midline scar right up the back of his neck that was “ropy,” hypertrophied, and hairless. Nearly all of these areas ran right through the “safe donor” area that would typically be used for a linear “strip” excision, and the thin areas were all too big for a scar reduction surgery (i.e. “just cutting them out”) even though his skin would be elastic enough to allow for this technique. He had mild signs of male pattern hair loss in the frontal area and crown and had no history of male pattern hair loss (or even any hair loss) on either side of his family. Part of the visibility of this patient’s radiation-induced hair loss could be attributed to the fact that he had very thick and dense hair elsewhere on his head, so the dichotomy between the two made the appearance of the balding areas more noticeable. This is common in men whose crown (vertex area) goes slick bald while maintaining a strong fringe, also known as the “Friar Tuck” appearance. Add to this the fact that his hair was very dark compared to his scalp, and you have a high-contrast situation that begs for balance. The rest of his physical exam was unremarkable. He kept his hair at a short length because growing it longer not only did not cover the scars but also it accentuated the disparity between the thinner and thicker areas. 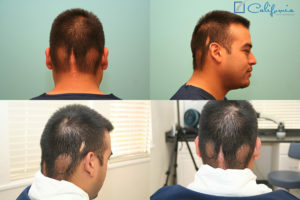 Plan: Since the safe donor area was straddled by the problem zones and since he had been told the problem areas were too large to resect (even using a technique known as “tissue expansion”), the Follicular Unit Extraction (FUE) method was the obvious choice for moving some hair in order to help this man’s appearance. The multi-dotted diffuse scarring of the FUE method would provide him a significant cosmetic advantage, and he definitely had an adequate donor supply to meet the demand for filling these areas. After discussions about the possible usefulness of trying minoxidil 5% foam once a day for at least a year to attempt to improve the growth of his remaining hair and finasteride for stabilizing any future male pattern loss, the plan was made not just to fill in the thin areas but also to thin the surrounding dense hair in order to equalize the entire area using the FUE method. That is what made this case particularly tricky: areas with absolutely no hair (i.e., zero follicular units (FU)/cm2) would be transplanted to the approximate density of the surrounding tissue (which was ~70-100 FU/cm2), while the most cosmetically significant areas – the two, large thinned areas at the back – would be transplanted to the intended “thinner” density (~50 FU/cm2) that would result when the hair was taken to fill them. At the last minute, the patient requested to fill in even the big “ropy” scar at the midline with a few grafts, even though he thought he might have that particular part of the scar removed by his original brain surgeon at some time in the future. Results: This patient obtained a total of 1,485 grafts. The transection rate was calculated at 4.7%, and was noted to be higher nearer the areas of scarring than elsewhere in his ample donor space, which is typically the case. Discussion: This case is unusual in that it required not just filling in blank spaces but also subtracting just enough from already hair-bearing areas to make everything blend seamlessly. It is a perfect example of the utility of the FUE technique since no other option would have given him such an excellent cosmetic result. The entire case was performed pro bono, and the patient was very pleased and happy with the end result. He was even finally able to grow his hair long without feeling self-conscious.